Systematically Working with Multimodal Data is a hands-on guide that is theoretically grounded and offers a step-by-step process to clearly show how to do a data-driven qualitative Multimodal Discourse Analysis (MDA). This full-color introductory textbook is filled with helpful definitions, notes, discussion points and tasks. With illustrative research examples from YouTube, an Experimental and a Video Ethnographic Study, the text offers many examples of how to deal with small to large amounts of data, including information on how to transcribe video data multimodally, including online videos, and how to analyze the data. This textbook contains ample theory, directions for literature, and a teaching guide to help with a clear understanding of how to work with multimodal data. 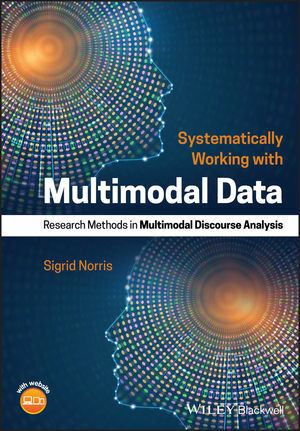 Written for advanced undergraduate, graduate and PhD level students, as well as participants in research workshops, Systematically Working with Multimodal Data is an authoritative guide to understanding data-driven qualitative Multimodal Discourse Analysis. Sigrid Norris is Professor of Multimodal (Inter)action and Director of the AUT Multimodal Research Centre at Auckland University of Technology, New Zealand. She is editor of the international journal Multimodal Communication and author of Analyzing Multimodal Interaction (2004) and Identity in (Inter)action: Introducing Multimodal (Inter)action Analysis (2011).